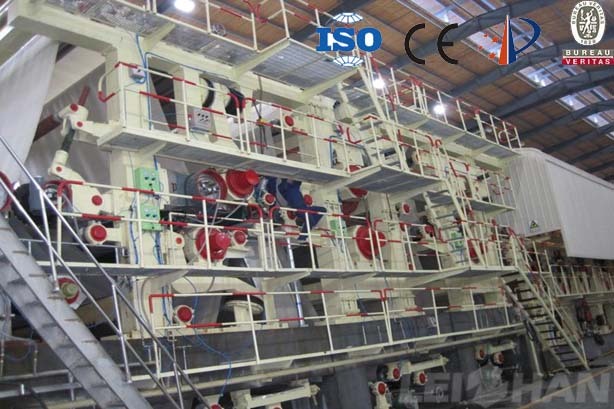 4600 Low Weight High Strength Corrugated Paper Making Machine net paper width is 4600mm, is mainly used for making low weight high strength corrugated paper. The following is the main parts of corrugated paper machine. 1. Headbox: Air-cushioned headbox, by controlling the gas pressure inside the headbox to control and stabilize the pulping pressure head. 2. Wire Section: Single forming wire, the main components: chest roll, forming plate, dehydration board, vacuum box, vacuum couch roll, wire-driving rollers, wire-leading roll and rack, etc. 3. Press Section: it is divided into 1st press, 2nd press, 3rd press. 1st press is a K-type combined press with a vacuum suction roller, K-type combined press is equipped with a coating metal roll, a vacuum press roll, a stone roller, and with upper felt and lower felt; 2nd press、3rd press is the press with large diameter roll , each equipped with two coating metal roller, and with upper felt and lower felt. 1st press, 2nd press, 3rd press are equipped with leading felt roller and felt suction box. 1st press, 2nd press, 3rd press pressurized way is corrugated tire pressure. 4. Front Dryer Section: 24 pieces Φ1800 dryer cylinder, 8+8+8 group drive. Equipped with semi-enclosed hood. 5. Beveled Surface Sizing Machine: Equipped with a surface chrome-plated metal roller, a coating metal roller. The surface sizing press machine pressurized way is corrugated tire pressure. 6. Back Dryer Section: 12 sets Φ1800 dryer cylinder, 6+6 group drive. Equipped with semi-enclosed hood. 7. Reeling Section: Pneumatic horizontal reeling machine.